The subject of geo-politics has always held a fascination, fashioned a great intrigue in the mind. What lies behind the headlines; the political maneuvering, the back room deals, the secret handshakes taking place in smoky parlors? 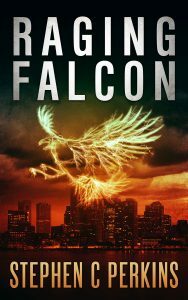 Inspired by contemporary events, Raging Falcon is a fascinating saga. It is a tale of tribulation, romance, survival, redemption, and ultimately, spiritual transcendence. The characters are primarily drawn purely from fervent and active imagination. However, one thought it would be terribly fascinating for the reader(s) to experience those fictional characters posed within the milieu of recent and familiar historical events along side genuine figures culled from American history. It is this rather unorthodox approach combined with an epic historical narrative utilizing imaginative creative license to effectuate a dystopian future that gives Raging Falcon its uniqueness and originality. In this new world the sun had set forever. The walled region of New Salem spread out for miles in grim panorama under the overcast gloom. Entire blocks of dilapidated buildings were stacked and packed like blandly-colored boxes of Kleenex, one on top of the other. Beyond the grim brick walls sprawled "open spaces," ghostly mists rising from darkened forests and gloomy meadows. No one was allowed trespass beyond heavily-guarded walls, on pain of death, for fear of offending Holy Gaea. Only those with a special permit, granted by the council, had permission to live in the eight designated sectors of "sustainable dwellings" along the highways patrolled by S.T.A.R.S. Not so long ago, the old gods had been condemned to death. So, too, was an annual percentage of the total population.